When I was a child, I loved to have tea parties. It was one of my most favorite things in the whole wide world to do. My mother was a fabulous sport, making me pots upon pots of tea. So last weekend, when I had the opportunity to hang out with my friend Anna, who's four years old, I suggested we have a tea party. She was stoked. 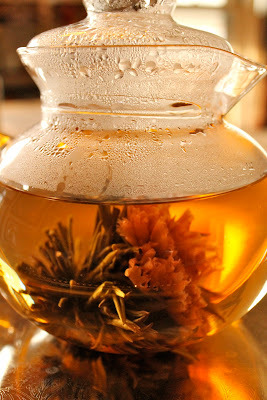 I have this really great flowering tea and it's the most beautiful tea ever--perfect for a tea party with a four year old. 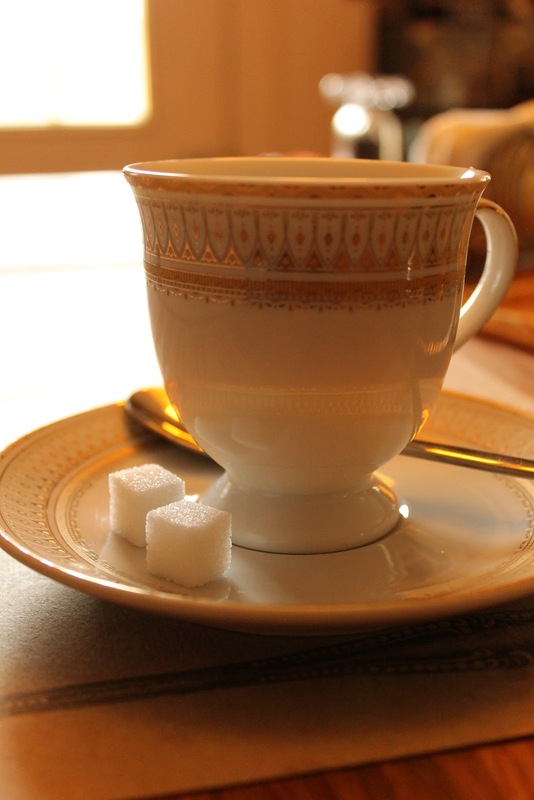 There are some essential items for the perfect tea party. The first is real tea in a real teapot. The second is sugar cubes. Sugar cubes are so much fun no matter what your age. The third is a fancy cream holder--doesn't matter if you use cream or not, but you have to have it because it's cute. The final is some great tea cookies. I was really lucky to have some great tea cookies on hand straight from Scotland (thanks to my sister-in-law.) Anna declared right away that my Scottish shortbread cookies were her new favorite, which made me exceedingly happy. 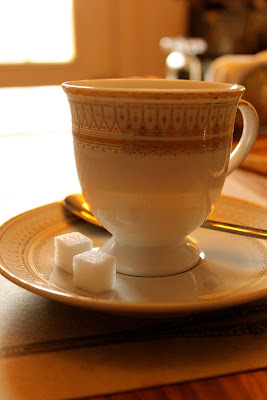 These sugar cubes were elegant and really added to our tea party if you ask me! 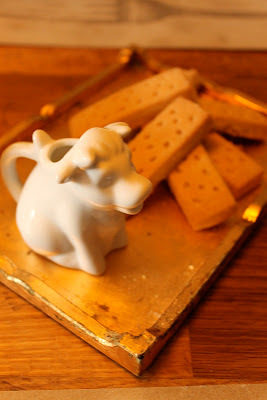 Moo cow with cream and Scottish shortbread cookies! 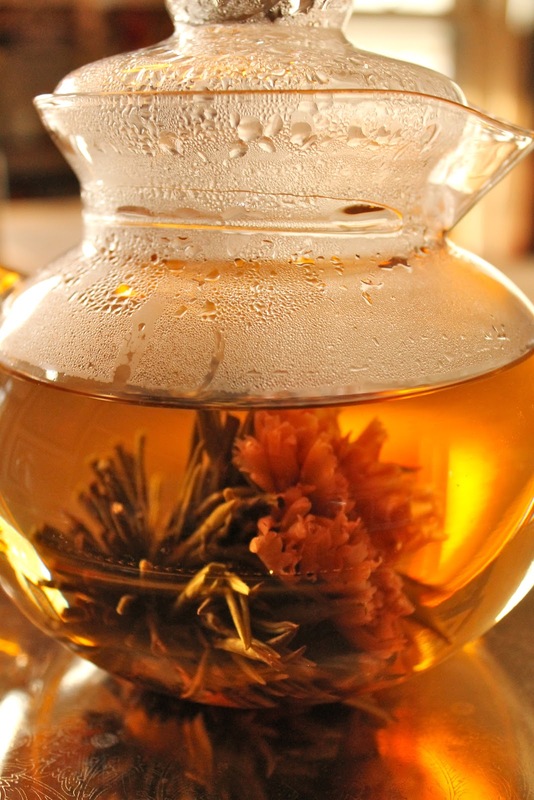 Flowering tea, which is awesome no matter what age you are! It's a green tea with jasmine, and I have to say that sharing the experience with a child of watching the flower bloom when you pour in the hot water is a TON of fun. 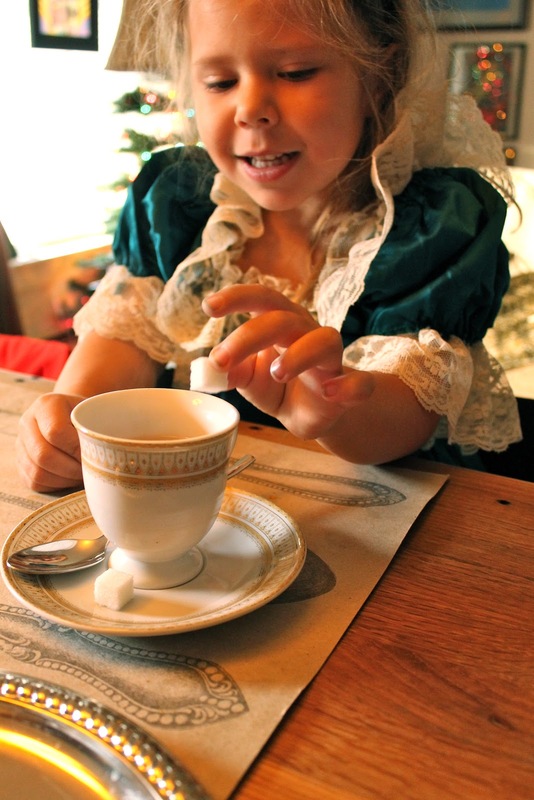 One of the best things about having a tea party with a four year old has to be the conversation. It was so authentic and lively! She had the cookies divvied up in no time, and informed me that the best part of tea parties is that "you get to try new tea." (I totally agree by the way!) Also, she told me that eating slow was part of the manners of having a tea party--I really am inclined to agree with her on that one, though I admit I didn't follow it--I scarfed my cookies like a rude tea party goer. 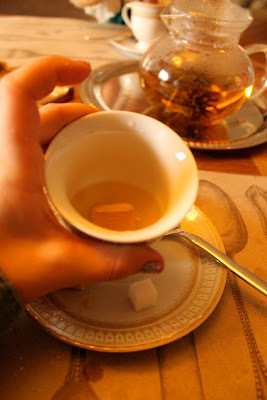 We tried to watch to see if they melted, but the tea was hot so they dissolved right away--which was equally exciting. Anna exclaimed, "I can't find it!" We had a grand time and even practiced putting our pinkies up. We even did the "double pinkie up" which is, I'm sure, the height of sophistication. When Anna had a double pinkie up fail and spilled tea on her dress, she got a little upset, but I assured her that dress up dresses were meant to get dirty because sometimes when you are having too much fun, you get dirty in the process. This made her feel better. When her shortbread fell into her cup, she said, "Oh no! My cookie fell in!" And then I told her to give it try and see if that made it extra yummy. Turns out, it did and that was how we ate the rest of our cookies! She's such a lady, so she uses her spoon. 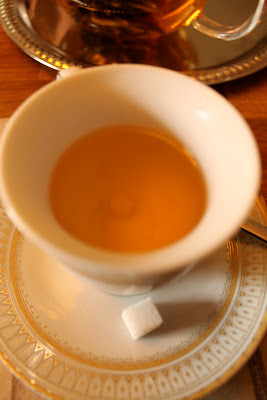 A tea party is a great way to connect with a child and do something that doesn't include the television (which is no small feat with today's youngins!) Talking with kids is a great way to interact with them and hear about all the fun things going on in their heads. I learned a lot, for instance, the fact that it's okay if adults help a child go to the bathroom, but it's NOT okay for a dog to be in the bathroom with a kid. Anna informed me that this is why she likes her pet hamster--because he knows how to take his privacy and also how to give it. Go figure! Tell me, when's the last time you had some kid time that included no TV? What fun and hilarious things did you lean in the process??? 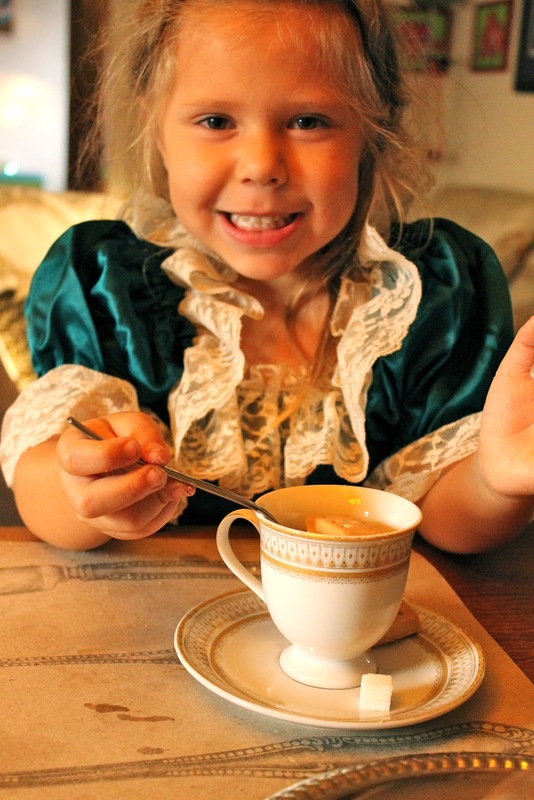 Can't wait to have a tea party with my kids one day! Make sure you invite me so we can all tea party together!! !